DONETSK, Ukraine -- Fancy camping for 120 euros ($160) a night? Or how about 3,600-euro ($4,797) hotel room? 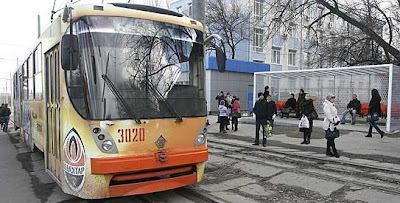 People stand at a public tram stop, designed to look like a goalpost, as part of preparations for the Euro 2012 soccer championship in Donetsk March 27, 2012. Football fans heading to Ukraine for Euro 2012 are set to be hit by among the highest accommodation costs in the world. Many in the tourist trade in what is one of Europe’s poorest countries are looking to use the three-week tournament to make not so much a fast buck as a light-speed one. In the eastern city of Donetsk, one of four Euro 2012 host cities in Ukraine, a hotel near the stadium is charging 3,600 euros ($4,797) to stay on the night of the June 27 semi-final. That’s 85 times its non-tournament rate of 42 euros ($56). Fans can always try the youth hostel, where a double with a shared bathroom down the corridor is 1,400 euros ($1,866). If not, there are tents at a campsite going for 70 ($93) to 120 euros ($160). “This is utterly ridiculous. It’s plain abusive,” said a West European travel agent used to big sports events, on condition of anonymity. “Hoteliers are taking advantage of the situation,” he added, underlining the mismatch between supply and demand in ex-Soviet Ukraine. Euro 2012, co-hosted by Ukraine and neighbouring Poland, marks the first-ever edition of the quadrennial, 16-nation football showcase behind the former Iron Curtain. The infrastructure challenges in Poland, now an EU member, have paled in comparison with Ukraine’s. “There’s a big difference with Poland, where prices have gone up, but there is much more available,” said the travel agent. He noted he did not encounter similar headaches at Euro 2008 in Austria and Switzerland, nor at the World Cups in South Africa in 2010 and Germany in 2006. Euro 2012 kicks off in the Polish capital Warsaw on June 8 and ends with the final in its Ukrainian counterpart Kiev on July 1. With 1.4 million fans expected to flock in, the hosts aim to use the tournament as a shop-window to boost future tourism. But warnings from top Ukrainian officials, as well as European football’s governing body UEFA, that prices are tarnishing the country’s image have had little impact. With just over two months to go, it is near-impossible to find a reasonably-priced room in Ukraine’s host cities — besides Donetsk and Kiev, they are Lviv in the west and Kharkiv in the east. Industrial Donetsk and Kharkiv are hardly tourist hubs, meaning the problem is worst there. Ukrainian authorities recently urged fans to sideline the hotel sharks and opt for recommended travel agents — but they mostly offer university dormitories, with a twin room with a shared bathroom costing 66 ($88) - 130 euros ($173) a night for a minimum three-night stay. The government has vowed to take action, with Deputy Prime Minister Borys Kolesnikov slamming “greed”. “Our government has enough power to reduce their appetite,” he warned recently. David Taylor, chief executive of UEFA’s events arm, also flagged up concerns. “Of course UEFA cannot fix that ourselves. We don’t manage hotels. But we do think it’s not a very good image to present of trying to charge as much as possible,” he said earlier this month. England play their Group D opener with France on June 11 in Donetsk. But fan figures may fall short of expectations, amid reports that only half of the 7,000 tickets for that match available to supporters via the English Football Association have been sold. “They won’t want to spend thousands of euros, when you see the exorbitant prices here,” said Olexander Atamanenko, boss of Donetsk’s brand-new stadium. Ukrainians angry over the harm to their reputation are mustering on Facebook to host fans at home for free. Accommodation problems are seen as a major reason why more supporters than usual are expected to opt for charter flights to head to matches and return home the same day. Around 50 percent of Euro fans normally take that option. While that rate is expected in Poland, it could hit 65 percent in Ukraine, UEFA says. Some supporters have simply given up. “A thousand euros ($1,333) for a room! And what kind of service do you get? A cold breakfast, sheets full of holes and a leaking air conditioner,” said England fan Jens Barthmann, who used to work as an English teacher in Donetsk. “I’m going to stay at home and watch the matches on TV,” he added. Hi, I am Alex from Poltava. I run a travel agency in Poltava, Ukraine. Poltava is not a host city of Euro 2012 tournament but there are some English fans who are contacting me. They are considering staying in one of Poltava apartments that I have on the site, not far from train stations and then taking a train to go to Donetsk to see the football games! I thought this might be interesting. Everything will be so expensive. I would recommend driving with your own car to Donetsk (beware bad roads though) and sleeping inside your car. Well, the car should be big enough to sleep in it. I know, it is not as comfy as a hotel room, but at least you don't need to pay more than a thousand euros per night of a hotel stay!